It was so early in the morning when our guides woke us up…I don’t think the birds were even chirping quite yet. They told us to move quickly and that we needed to be ready to leave in 30 minutes. We packed our things, dressed warmly and put our headband flashlights on our heads. It was pitch dark and we would be trekking fast. The plan was to arrive at the Sun Gate (the top of the entrance to Machu Picchu) just as the sun was rising. The hike to the Sun Gate was about 45 minutes but first we all had to sit at the park trail entrance to wait for it to be unlocked. They close the trail at night so people can only access the ruins during business hours. We were the second group in line with so many other people behind us. After waiting for close to an hour, the entrance was unlocked…and that is when the race began. We were moving quicker than we had in the past 4 days. We couldn’t even stop to take a picture because we would have been trampled by all the people behind us. We were careful to stay on the inside of the trail as we could see the cliff drop off on our right side. As the sun started to rise, we finally started to see the beautiful scenery we were rushing through. The hike although relatively short in comparison to the other days was steep as we were going up and down ancient rocky steps. We specifically admired the carved steps made from one huge piece of granite…sometime 10-15 steps. We finally arrived at the Sun Gate. Ideally, there would be no fog and we would be able to stand at the gate and look down onto the magnificent city of Machu Picchu. BUT…there was a lot of fog. It was only about 6AM and we were at very high elevation. Maybe this is why the Spanish Conquistadors didn’t find this city? From this view, if the fog were cleared…we would have been able to see the entire city. BUT, with the fog…it looked like a few crop terraces and mountains. After waiting a bit in hopes of the fog clearing we continued on. We still had about an hour to get from the Sun Gate to the actual city itself. We stopped at another point and waited to see if the fog would clear, but still no city could be seen. 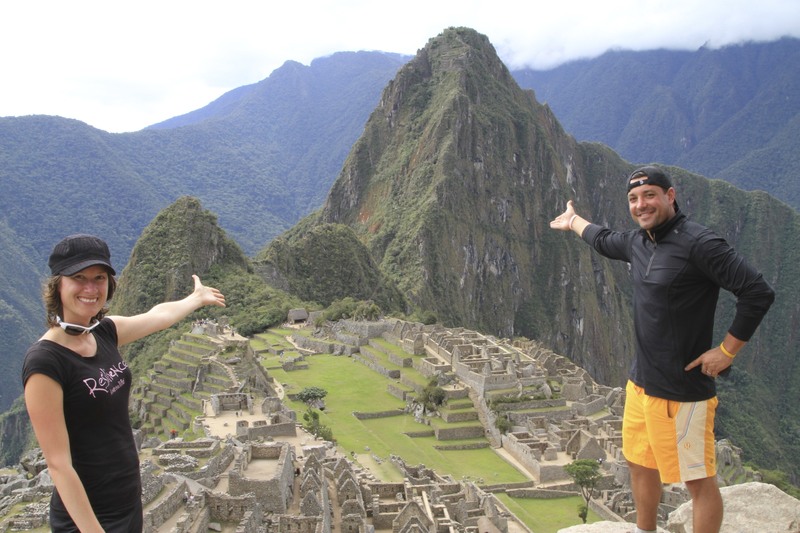 We ate a snack and kept moving forward…our anticipation to see Machu Picchu was growing. About an hour later, we finally arrived. This was it…the crown jewel…it really was so majestic. The fog would move for a moment to reveal the city and we could snap a quick picture but then it would re-settle and completely hide it. After sneaking in our pictures, we moved into the ruins themselves as our guides pointed out various buildings and their significance. The site itself was built around 1400AD under the Incan ruler, Pachacuti. Since the Incas didn’t have a written language no one is sure why this massive city was built. The city seemed divided into 2 sections. One with all the homes, temples, guard-house and fountains…and the other consisting of the agricultural section which had rows upon rows of crop terraces. We could see the water irrigation system flowing through each level via what looked like their version of a gutter, allowing water to flow downward. They built this system 600 years ago and most of it is still working today. We had seen so many other Incan cities with their distinct crop terraces throughout the past 4 days…but this city was by far the largest. It had a wall surrounding the city about 19ft tall much like other medieval villages we had seen in Europe in order to protect and secure the city. The whole place was built onto the steep slope of the mountain and at an elevation of 8,040 ft. If people were below in the valley near the river looking for this city…they would not be able to see it. This was a strategic move by the Incas. As we walked through the ruins, we stopped in what was the religious sector and listened to the guides talk about the human sacrifices made by the Incas, the temples and royal tomb. They showed us the rock query where the Incas were getting their rocks from. You could see the rocks clearly unfinished sitting in this area. Our guides explained to us again…how no mortar was used (which allowed the rocks to move slightly when there was an earthquake) and the boulders were polished and fit together to create the walls and buildings. How did they move these huge rocks and boulders from the rock quarry to the construction area? Some think they used 100’s of men to roll them. The guides took us to the sacred temple area. They showed us the building in which the Incas most likely did their rituals and sacrifices. It is said they used mostly young virgin girls based on the skeletons found. We continued to walk over to a huge rock formation deliberately carved. It was the Intihuatana rock which means “Hitching Post of the Sun”. This rock was built to measure the angle of the sun. It told the priests when the solstices and equinoxes occurred. They used information like this to assist them with planting crops and weather etc. Some say it was also used for some type of ritual. In the same area, the guides pointed out the Sacred Rock. If you look closely it has the same exact outline of the mountains in the distance, including Machu Picchu mountain…was it a blueprint they used to build Machu Picchu? Why was it so sacred? Another rock in the same area was used to tell direction…we held our compass to it and the point of the rock directly faced north. After our guides gave us the highlights, we had a few hours to explore on our own. There were other hikes to take around the city and other mountains to climb that had additional Incan ruins like the moon temple, but Giff and I decided to take it all in and spend our time getting to know Machu Picchu. It had been a long 4 days and we were dragging a little bit! There were more than 100 flights of stone steps leading to the various buildings. We noticed again how amazing these granite pieces were, they were huge…getting 10-15 steps from one rock. How did they do it? Even today carving granite is challenging. We took our time meandering through the old houses and sitting on the edge of one of the cliffs looking at the mountains surrounding us. It is something you have to experience for yourself, it was true utter beauty to be in the middle of the Andes Mountains. As good as our pictures are in this blog…we just couldn’t capture the magic we experienced. We saw many people congregated at one building at the top of the city. We contemplated walking up all the stairs since we had already hiked from way above but we were so glad we did. It was the guard’s house. It made sense that the guard would have a view of the entire place so he could be on the look out for any trouble. We got our best picture up there…looking down at the city ruins with the 2 main mountains as the backdrop. After spending a couple of hours walking around Machu Picchu, we finally took the bus down the mountain to a city called Aguas Calientes, meaning hot water (because of their natural springs). The road down the mountain was a bumpy ride…zig-zagging back and forth but was a quick 10 minute ride packed with people. The town of Aguas Calientes was cute, with train tracks running right down the center. We found the restaurant our guides had told us to meet in. We said our goodbyes to our guides as they left on the earlier train. We would be taking the late train back to Cusco with the rest of the group…so we had some extra time to kill. We sat at the restaurant and had some dinner before checking out the main center. There was a main street which had multiple vendors, restaurants and coffee shops…all lined up for tourists which was obviously their main source of income. We enjoyed shopping and seeing their main square. We couldn’t resist buying a handmade ceramic chess set (Spanish vs Incas) . After a short walk around the town…we met up with the rest of our group and boarded our train. We were all pretty tired from our trekking adventure. We sat on the train, chatting amongst ourselves and yearning for a hot shower and pillow for our head. We thought our day was coming to an end… After riding the train for a couple of hours, it dropped us off in another town where our tour bus would pick us up to drive the remaining hour+ back to Cusco. We all arrived and fought the crowds coming off the train to find our bus. We sleepily loaded our things on and found our seats…resting our heavy heads on the seat. About 30 minutes into the drive, we suddenly smelled fire. The bus quickly pulled over to the side of what seemed like a pretty dangerous curve in the dark. The driver yelled at all of us in spanish to get off the bus. We all ran off, half asleep but waking up quickly. We were standing in tall grass on a mountain in the dark and the bus was smoking. Seriously?? The driver asked for a flashlight and then took a piece of the floor off to look at the engine which was clearly not doing well. After some messing around with it, he made a call on his cell phone and then told us to get back on the bus. It was the conveyor belt. He got the bus to start again (ummmm….is that such a great idea?) and drove 5-10 minutes to the next town where it was safer to pull over and wait for the next bus which he called to come get us. The other bus finally arrived…we re-loaded our stuff and rode to Cusco where we then got in another car that took us to our hotel. Exhausted, we went straight to our room…straight into the shower…and straight into bed. We would so love to sleep-in tomorrow but our flight leaves at 9:30AM for Ecuador and since it is an international flight…we have to leave the hotel at 7AM. Note to self, do not schedule ANYTHING for the day after taking a 4-day trek to Machu Picchu.